This pre-sale price ends on 1st October at 9am. Maximum number of single tickets per household is 10. For group bookings please get in touch directly. All children must be accompanied, so their fast track status is the same as their accompanying adult. Physical tickets will be posted out one month in advance for UK addresses and sent recorded delivery. Booking fee is £2.50 per order but is waived for orders under £50. For orders outside the UK your tickets will be available for collection on the day. Please keep your tickets safe as replacements cannot be provided on the day. Tickets will be sent directly to the person who made the booking. Tickets will be in the form of waterproof, single-use wristbands that must be worn to the gate on the day to enable access. Please do not remove the sticky layer in advance of the day as they are single use and cannot be removed and reapplied. Tickets will not be sent out until ONE MONTH before the event. If you have not received your tickets by 14 days before the event please get in touch directly. N.B. All customers will be added to our mailing list, which can be unsubscribed from at any point. You will also be included in emails that communicate important information about the event. 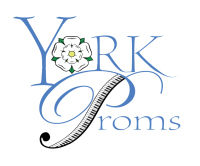 Copyright 2017 The York Proms.